Thousands of Hamas followers gathered Friday to donate money and jewelry to their cash-strapped government, while a Western boycott stirred debate inside the militant group over whether to accept a state alongside Israel. The Hamas-led government has been under increasing economic pressure since taking office in March, with Israel halting $55 million in monthly tax transfers to the Palestinians, and the United States and European Union freezing hundreds of millions of dollars in aid. Without the money, the Palestinian Authority has been unable to pay its 165,000 workers for the past two months and is having trouble buying medicines and other vital supplies. In a show of solidarity with Hamas, about 5,000 Palestinians gathered in the northern West Bank city of Nablus to make personal contributions to the government. Several women put jewelry in a collection plate. A group of gunmen from the Al Aqsa Martyrs' Brigades, affiliated with the Fatah Party, fired rifles in the air before donating $22. The contributions were touted over megaphones, and some people said they were donating their entire paychecks. "These donations are our way of telling the world that we can live without them, and our children are paying what the Europeans should be paying," said Bassam al-Shaqaa, a former mayor of Nablus. A telethon, broadcast on television with Hamas officials fielding calls, received pledges from as far as Qatar and Saudi Arabia. Officials did not say how much money they raised, but it was at most a tiny fraction of the tens of millions of dollars the government needs. Israel and the West have said they would only deal with Hamas and restore the flow of money if the group recognizes Israel, renounces violence and abides by prior peace agreements. Hamas leaders have publicly rejected those conditions. But in private, they have debated whether to recognize Israel in an effort to extricate themselves from their economic crisis, according to a moderate Hamas official who spoke on condition of anonymity because of the secret nature of the discussions. Many Hamas leaders favor recognizing Israel, but Foreign Minister Mahmoud Zahar and the group's top leader, Syria-based Khaled Mashaal, have refused, the official said. The debate became public with the release of a proposal worked out by top militants, including those from Hamas, imprisoned in Israeli jails. The document calls for the establishment of a Palestinian state on the lands Israel captured in the 1967 Mideast War: the West Bank, Gaza and east Jerusalem. That implicit recognition of Israel would be a major shift for Hamas, which calls for replacing Israel with an Islamic state. The document also includes Palestinian demands that Israel rejects, including the return of millions of Palestinian refugees to homes in what is now Israel and a complete withdrawal from all of the West Bank and east Jerusalem. The document also asserts that Palestinians have the right to attack Israelis in the West Bank, but that Israel itself should be off-limits for bombings and shootings. Prime Minister Ismail Haniyeh of Hamas praised the prisoners' work, but fell short of endorsing the proposal. "The document includes very important useful points that will contribute to remove some obstacles, but it needs more deep study," Haniyeh said, adding that it would be among several documents presented to a conference of Palestinian factions this month. The debate inside Hamas is part of an ongoing process of moderation that included the group's decision to join mainstream Palestinian politics by running in the January parliamentary election, said Moheeb al-Nawaty, author of a book on Hamas. 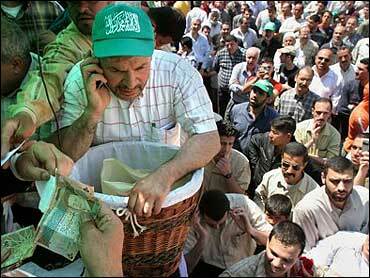 Hamas "does not want to change under this pressure, to appear as if it is responding to this pressure," he said. "At the same time, it is looking for the appropriate moment and the appropriate occasion to change. And this prisoner document is one of the appropriate occasions." The international boycott has only strengthened the hand of Hamas' leadership abroad, which takes a harder line than many of the newly elected officials, he said. While Hamas officials in Gaza and the West Bank were debating the document, Mashaal told a conference in Qatar that Palestinians should unite behind a platform of "liberating Palestine, not recognizing Israel and adopting the path of jihad and resistance." Regardless of which side wins the debate, it is unlikely that anything short of explicit recognition of Israel will persuade the United States and the European Union to restore relations with the Palestinian government. While not directly addressing the proposal, U.S. Embassy spokesman Stewart Tuttle reiterated that because Hamas is listed as a terror group, "the U.S. government and U.S. citizens are prohibited by law from providing them with any material support." Western donors agreed this week to resume some humanitarian aid to the Palestinians, but they said none would be funneled through the Hamas government. In Sweden, Palestinian Cabinet minister Atef Adwan and the controversial Austrian Rabbi Moishe Arye Friedman pledged Friday to work to build ties between Hamas and anti-Zionist Jews. Friedman said his congregation would "do everything in practical terms to help the Palestinian people," including sending money and food to the West Bank. He declined to give details. Friedman is chief rabbi for hundreds of anti-Zionist orthodox Jews in Vienna but is shunned by Austria's 7,000-member Israelite Religious Community because of views that are repudiated by most Jews and also, in some cases, embraced by far-rightists.